Soon after the birth of my daughter, I was thoroughly introduced to the life-cycle of a stain. I’d find the most darling outfit for our precious baby girl, only to have her wear it for less than an hour and stain it! Everyone would tell me to carry a chemically toxic stain removing pen in the diaper bag and just apply it right to the stain while she’s wearing it. Something about that just didn’t seem right. You see, I already had begun the path to natural living and I would rather give the outfit away then use a toxic cleaner on it. This became quite an expensive frustration between my husband and I. For some reason, I didn’t think any natural cleaners would remove stains. Maybe it was my new mom brain fog. But, for whatever reason, this carried on for longer than I’d like to admit. 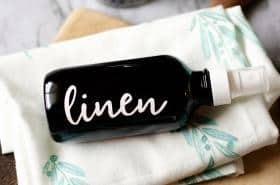 Low and behold after making a successful natural liquid laundry detergent, I discovered that there are a number of ways to combat stains without chemicals! 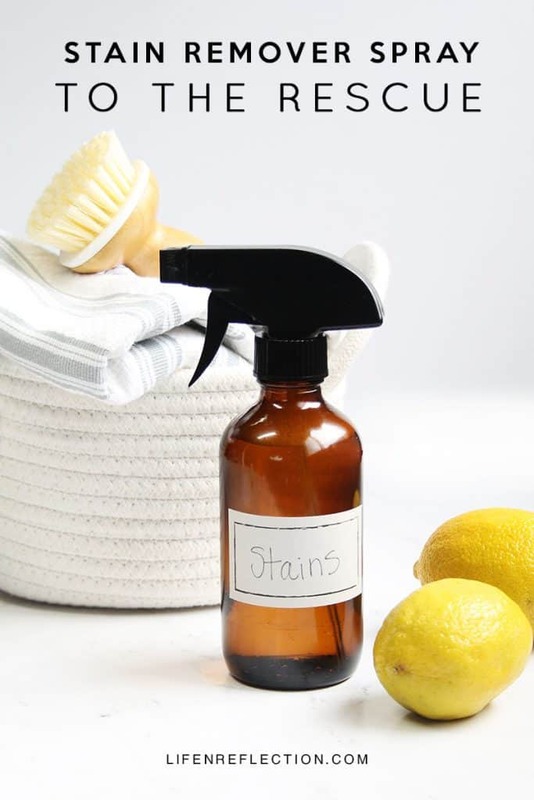 And it’s high time I share this DIY natural stain remover spray with you. It works on practically any stain. Strawberry yogurt, pizza sauce, vomit, and even grease are no match for this stain removing hero! In my quest to find a natural stain remover spray I found four ingredients did the job. Vegetable glycerin works as a thickening agent which helps liquid castile soap grab the stain. Castile soap while mild and gentle on the skin is a strong soap that does wonders for any natural cleaner. And lemon essential oil breaks down grime and grease to cut through stains. Just a touch of hydrogen peroxide brightens and reaches hard to get out stains. 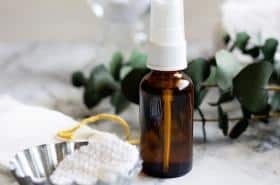 Using a funnel pour 1/4 cup vegetable glycerin, 1/4 cup liquid castile soap, 1 tablespoon hydrogen peroxide, and about a 1/2 cup distilled water into an 8-ounce glass spray bottle. Remove the funnel and add ten drops of lemon essential oil. Place the nozzle on the bottle and with spray turned off, shake gently to combine. Blot liquid stains with a cloth. Then gently shake stain remover spray and liberally spray stain. Lightly rub the fabric together to or gently scrub stain remover into the fabric. Allow stain remover to soak into fabric for a least 10 minutes before washing. Like most stain removing sprays, it works best when applied sooner rather than later to stains. Most often clothes that have been washed and dried without treating, will cause a stain to set into the fabric. Nonetheless, if you have a favorite shirt you discover a stain on after the fact, give it try. Who knows? As always with any cleaner, test first in an inconspicuous spot. 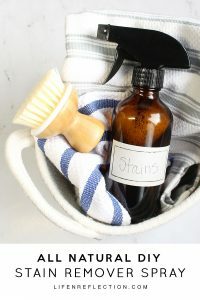 Although, I have not encountered any issues of discoloration with this DIY natural stain remover spray. 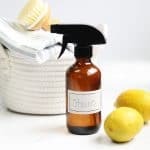 Making natural home cleaning products is empowering, once you see how homemade cleaners are more affordable and safer for your family, you’ll be hooked! Want more green recipes for home and beauty? Grab your copy of my Beginners Guide to Natural Living Book free! 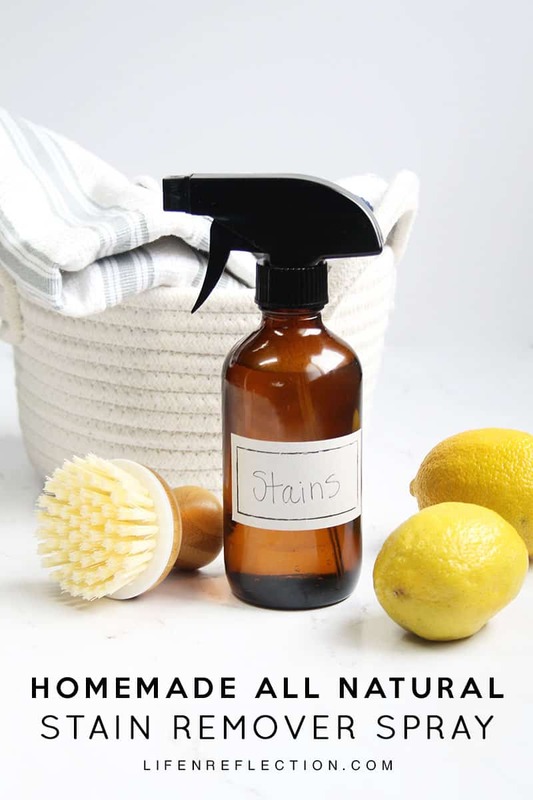 Remove even the toughest stains with this DIY natural stain remover spray. 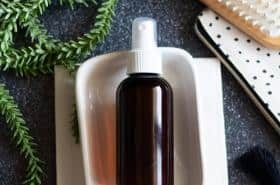 A powerful nontoxic, stain-fighting spray made with just 4 simple ingredients. Pin it now to make later and don’t miss my 3 Epic Reasons to Use Wool Dryer Balls! Find more natural cleaning recipes in No Nonsense Bathroom Cleaning Methods, That Work. Not ready to make your own cleaners? Then grab a free 5 piece Mrs. Meyer’s natural cleaning kit from the Grove Collaborative. Ive been looking for this for ever! Thank you for this recipe. Awe, you’re welcome Tonye. I seriously haven’t come across a stain yet that this didn’t remove! Hi,just thought I’d share. I recently removed a grease stain by rubbing in my homemade laundry soap n leaving it for a while,then washed as usual. Will try this for other difficult stains. Sharifa, that can be helpful too. Thanks for sharing! This is SO great! I have been searching for a stain removing recipe that WORKS! My girls are the absolute messiest and I struggle to get their stains out with other non-toxic recipes I’ve tried. Totally giving this one a try! 🙂 Thank you so much for sharing! Been there, I’ve been using this one for years and works for all our family’s needs.